XIAOMI, the Chinese company that recently started its operations in India is currently creating a lot of buzz with its flagship smartphone “Mi 3”, a high-end Android phone launched at a highly competitive price of Rs. 13,999. Mi 3 is being sold in India exclusively through Flipkart and it’s next to impossible to buy it, due to intensely high demand and low supply. Xiaomi is also known for their PowerBanks and accessories such as eye-candy covers for phones. Unfortunately, Xiaomi hasn’t introduced their accessories line-up in India yet which is said to arrive with the launch of Redmi 1S. The pricing for their 5200mAh and 10400mAh powerbank is Rs. 799 and Rs. 999 respectively as seen on Flipkart, currently unavailable. “The Mi power bank is not just another powerbank.” It features a simple design with aluminum unibody casing that looks premium and beautiful. The device packs premium Li-ion batteries from LG and Samsung, USB smart-control chips and charging/ discharging chips from Texas Instruments for enhanced efficiency. Its surface is water and corrosion resistant, and it’s rigorously tested to withstand 5000 micro USB and 1500 USB insertion/removal cycles. It is compatible with all popular smartphones and tablets, and can automatically adjust the charging port output according to the connected device. Comes in 2 capacity – 5200mAh and 10400mAh with option to choose from seven beautiful colors. Out of curiosity, I bought a Mi 5200mAh power bank from e-Commerce site ShopClues that costed me Rs. 770 after applying a coupon. It was a great deal for a product that’s not launched yet but my excitement turned into big disappointment after receiving the package. The Mi powerbank sold by Shopclues was FAKE and they denied the refund. As the Mi powerbank is very popular, its counterfeit copies are being sold openly in most markets at a much lower price. The fake ones are difficult to identify unless you’ve tried a genuine one or are aware of the clones. Luckily, it’s really easy to figure out a duplicate Mi powerbank and there are several ways to do so. Firstly, it’s advisable to buy directly either from Mi official site or an authorised seller. Make sure to always buy a original powerbank as a fake one can be dangerous and is risky for everyday usage. 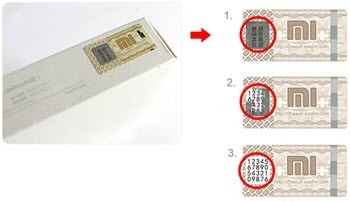 Method 1 (Simplest) – Check the originality of the product by looking for the anti-counterfeit label on the box package. Simply scratch the grey coating to find a 20-digit numeric code. Then visit chaxun.mi.com, select language or directly visit mi.com/verify, enter the 20-digit serial number and fill the Captcha code for online verification. Hit the ‘Verify now’ button and it should show that it is Mi power bank, that means your product is genuine. 1. See the LED lights, if they glow too bright and are uneven then you’ve a clone. The lights on real one are of even color due to a sheet of white shading paper. 3. The label on fake power bank is darker in color and the font edges aren’t sharp. While on the real one it’s light in color and the fonts appear smooth. 4. Short circuit I/O ports with USB cable – The LED lights on the counterfeit product will glow up and blink when it is short circuited. While LED light do not light up on the genuine one. 5. Check while charging the power bank – While charging, all 4 LED lights one the real product turn off on pressing or holding the power button, and light up again on releasing it. Whereas, nothing like this happens on the fake one when the power button is pressed/ hold on. 6. Check the provided USB charging cable – The genuine cable has a black interior and doesn’t has a Mi logo imprinted. The fake cable has a white interior in the USB port, is flimsy and has a Mi logo engraved into it. Please help me too . How about this serial number 79677004284328897511 fake or original ? dude i buy the product from flipkart and this comes with no box..
You saved me ! Thanks a lot. I bought a MI 10400 mah power bank from flipkart., and was shocked to find that there was no anti-counterfeit label on the box. There was no Mi label printed on the USB. So how can I know that the power bank I got from flipkart is genuine or not? It’s a genuine one. Flipkart ones don’t come with an anti-counterfeit label. I bought one from Chinese website.. without going all these procedures, I realized mine was a fake one…and I just realized there are Mi fake products. I am really disappointed with it. Please help me I just got the PowerBank from flipkart nd my code is 52838 21601 83456 27711 please tell me its fake or geniune.I checked it on prescribed website but i’m getting it. If you bought it from Flipkart then it’s genuine. Flipkart ones don’t have an anti-counterfeit label. I bought it from Ebay, it have anti-counterfeit label which seems authentic as per website. BUT most the other symptoms do not hold good. However I noticed its working very good for me. please help me!!!!!! its urgent to know,this retailer is selling at the lowers price.. It says “First Copy PowerBank”. I doubt its authenticity but the user feedback is positive. Buy at your own risk! Hi, here it is for 619/- is it fake or original? How can I check if it is not fake on http://chaxun.mi.com (in Chinese)? I am not able to enter verification code in Chinese! Even I don’t know Chinese. Verify using the alternative methods mentioned. Hi Ann. It may be genuine but chances are less because why anyone would sell it at same price as on Flipkart. May be, the box is genuine and product inside is a copy. I’d suggest you to buy it either from Flipkart or ebay (from this seller: http://www.ebay.in/itm/Xiaomi-10400MAH-Silver-World-Best-Power-bank-W-free-Mi-TPU-Cover-for-Power-Bank-/291369446883). eBay one comes with a free Mi original TPU Cover for Power Bank and 6 months seller warranty. Worth it! Mi offers the best value for money Powerbanks. 16000mah one costs Rs. 1999 on eBay which is quite high. Yes, the process should be same for other Mi Powerbanks as well. hii mayur, can i buy this from any store in delhi?? Hello my friend, I bought a xiaomi power bank too and I wanted to ask you, if it\’s fake or not… I bought it from geekbuying and the steps 3,4,6 are ok..also it has a code when I scratched but I can\’t check it cause of the capchta in Chinese… Is there yet a chance to be fake? Your reply would be very helpful… Thank you in advance!!!! I am afraid to buy xiaomi power bank as majorly fakes are sold. I plan to buy this one whats your suggestion this also gives 6 months warranty. Hi purchased mi powerbank but could not verify the 20 digit authentication code as the captcha is in chinese. Could you please help me in identifying whether the powerbank is original or not. I can\’t do the Chinese either. Do you mind checking my code? Would you be so kind to check my serial number of my 16.000mAh Xiaomi Powerbank? I have bought it from sanpdeal is it fake??? I\’m not actually sure if my MPB 10400mah is genuine. I tried to veriy it in http://chaxun.mi.com/ but they are in need of a chinese captcha which I can\’t read. I tried everything to translate to other website, but it doesn\’t work. could you pls help me? this is my code 80443 96349 12543 93753. Thank you alot! Hi Mayur. Thanks for this valuable article. I want to buy MI Power Bank (5200 mAh) from http://www.mi.com/in . \”Rocket Kommerce LLP\” is the Authorised Seller on this website for MI Power Bank. Do you recommend to buy it from http://www.mi.com/in ? I am intending to purchase a fake for Rs 300 – a 10400maH one. I am expecting it to have about 3000-4000MaH charge. If it actually turns out to be 3000+mah, I will be in a profit as original Mi costs Rs 520 for 4500mah (5200mah with 90% efficiency). Can you tell me what is the negative of buying fake?? Since you have already purchased it, can you tell me how much approx charge is useable? Very useful to check my powerbank is original or not? Thanks for sharing!! i am afraid that my powerbank is a fake one. i had ordered it from paytm. and it has all the qualities of a fake one that you have decribed. the powerbank works only for 30 mins and charges my phone to 40% only. Now what should i do to overcome this? Contact Paytm and ask for refund. Hello my friend, I bought a xiaomi power bank too and I wanted to ask you, if it\\’s fake or not… I bought it from geekbuying and the steps 3,4,6 are ok..also it has a code when I scratched but I can\\’t check it cause of the capchta in Chinese… Is there yet a chance to be fake? Your reply would be very helpful… Thank you in advance!!!! MI power banks purchased from Flipkart (ws retail) are 100% genuine. Rest from eBay paytm or snapdeal are clones and useless. i got a fake mi power bank. is it gud to chrge my phn or not plz rply to my mail..
Is this 20 digit code unique? Because we all got the powerbanks as Diwali gift (100 Power banks. The 20 digit code is same for all of them. Also the code is valid on mi website. Just bought the 10,000 mAh from Amazon seller Feeego (HK). Everything appears to be genuine except for the usb cable which is white although it does not have a usb logo. I am unable to verify the product because mi.com will not accept the English verification code. Could you please check for me? It\’s 35937 26969 42753 37321. I have entered the 20 digits but nothing happens. I mean no error or verification message. Should I assume my product is fake? is it original or fake? I bought a mi 20800 mah power bank from zookr.